Ciel-sensei’s student. Originally a feline, but it’s hard to say if this thing can even be called a cat anymore. In class, she constantly acts up in retaliation for having such little screen time. Details are unknown, but it seems she wants people to think she’s smart. …Of course, the Arcueid in the main story wasn’t smart, either, she just had grandmotherly wisdom. A mysterious lifeform that flies on top people’s head when they are close to passing out. Once she’s on you try not to take damage or do any crazy moves… how unfortunate. Originally from the Tsukihime help corner “Teach Me! Ciel-sensei” in which she played the straight man through and through. In Kagetsu Tohya she also appeared in an Arcueid event graphic, and her fame has continued to rise. Now she is basically TYPE-MOON’s mascot character. Ciel-sensei’s student. Originally a feline, but it’s hard to say if this thing can even be called a cat anymore. In class, she constantly acts up in retaliation for having such little screen time. Details are unknown, but it seems she wants people to think she’s smart. With the eye beams, “True Ancestor Beam,” the vaguely familiar blast, “Opuba!,” the warp skill, “Cat Out of Hell,” the uppercut that sends the opponent flying into the heavens, “Dead Neco-ning,” and many more, she destroys everything in her path. 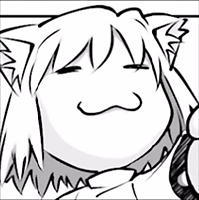 By the way, we actually recorded lines for Arcueid, Akiha, Len, and Ciel-type Neco Arcs. They were all pleasantly strange characters. Unfortunately, due to capacity problems we were only able to implement the Yuzuki Ryouka version. Still, if the chance ever comes around, I’d really like to debut the other Neco Arcs, too. ^ ナマモノ refers to “real people fiction,” characters based on real, existing figures (as opposed to a created character). Probably mentioned as a joke here.